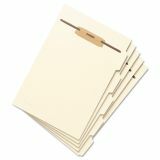 Smead File Folder Dividers with Fastener, Side 1/5-Cut Tab, Letter Size, 50/Pack - Create as many separate filing surfaces in one folder as needed using these stackable folder dividers. 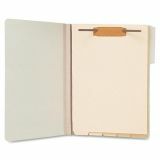 Each divider features a punched hinge at the top that fits over the fastener on the divider beneath it. 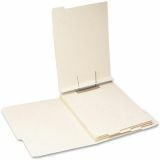 The bottom divider then fits over the fastener in the file folder. 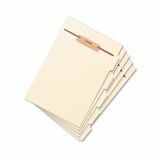 Sections can be removed from the folder without disturbing the order of the papers on the dividers. Hinge is scored for 1/2 expansion. 1/5-cut tabs in assorted positions along the side allow quick identification of sections. Handy for personnel, tax, or legal files, or anytime you need extensive categorization within a single file folder. 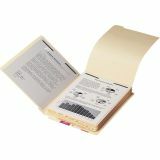 Use with end-tab or top-tab folders. Dividers are made of 11 point manila stock and offers reinforced standard 2-3/4" slit punching and 2" prong, B-style fastener at top."